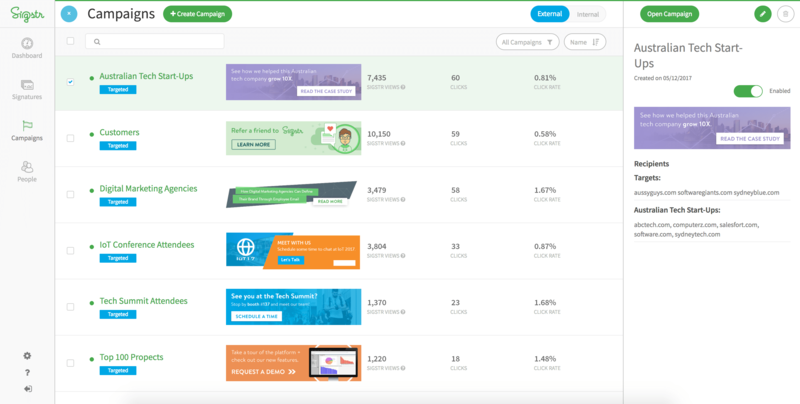 Sigstr, a web app that markets through email signatures, released a new account-based marketing (ABM) functionality designed to give customers the ability to target specific accounts, industries and regions with content tailored to each audience. Utilizing ABM functionality, customers can choose to assign a signature campaign to email recipients who match one or more email domains. When Sigstr users email recipients that match an assigned domain, a specified campaign is served. The ABM functionality is available to Outlook users who have implemented Outlook Agent 1.0.3 or higher. It is also available to Gmail users who have installed Sigstr’s Chrome Extension. Sigstr’s ABM campaign functionality is priced at $7 per user, per month—which is billed annually. Sigstr serves customers of all sizes with a seat minimum of 50 users. Act-On Software, Terminus and ZoomInfo have integrated this functionality into their ABM strategies. Sigstr provides an email signature marketing (ESM) platform that offers ABM functionality to serve tailored content to specific accounts, industries or regions. This is designed to increase account relevance, align ESM activity with account strategies and increase campaign engagement.